There are numerous ways to make money with a blog. I’ve already discussed a big one, monetizing your blog with Adsense. Another option that will further diversify your income sources is: affiliate programs. Affiliate programs for me have generally performed second to Adsense, but I know a number of bloggers where affiliate programs are their number one earner and I would suspect that may be the case for me here on Side Income Blogging as well. Regardless, affiliate programs are a great way add additional income to your revenue stream and provide value to your readers by recommending products and services to your readers. What are affiliate programs or affiliate offers? Let’s say that I develop a premium WordPress plugin and the sale price is $199. I set-up an affiliate program so that whenever a website or blog sends someone to my plugin sit and the visitor purchases my plugin, I pay the website or blog $50. Think of affiliate programs as sales commissions, as they are very similar. Some affiliate programs pay a percentage of the sale, others pay a fixed amount, while others scale up based on how many purchases have been made from your site. Affiliate programs are offered by product and services companies directly, but the majority of programs are handled by a third party affiliate networks. These affiliate networks are the best way way to find good affiliate programs for your blog. To use these affiliate networks, you just have to register. Once registered and logged in, you can then use the network’s search features to find suitable affiliate offers for your site and apply for them. Some companies approve you right away, while others will need to review your blog first. Overall the process is very simple. Once approved for an affiliate program, you can then get the special link code that you’ll use to link out to the affiliate product or program. In most cases, link code for both banners and text links are available. This special link code has to be used so that you get credit for the purchase if it’s made. ShareASale – One of my personal favorites. They have a ton of great programs and the site is easy to use and navigate. This is the network that I currently make the majority of my affiliate income from. They also have the Thesis affiliate program. FlexOffers – Another personal favorite. Their interface is incredibly easy to use. Commission Junction – One of the “big players” in the affiliate network space. If you take away anything from this article, the information in the next two sections is the core “stuff” I want you remember. What I am about to tell is the meat and potatoes of using affiliate offers successfully on your blog. Are you ready? 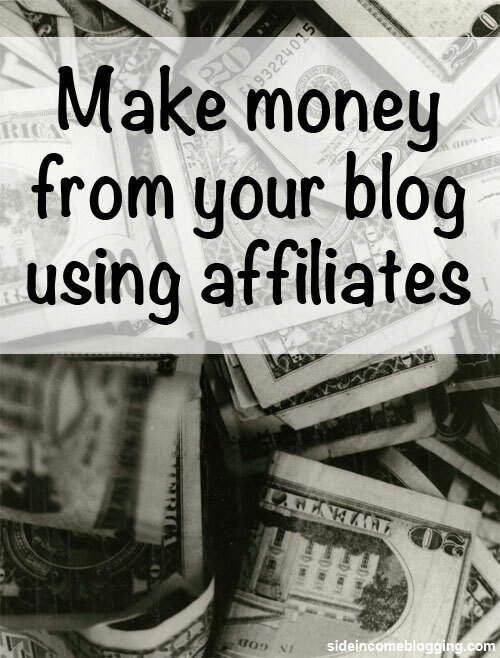 Far to many bloggers sign up for affiliate programs, get the banner images that the affiliate programs push, add the affiliate banners to their sidebar and wait for the money to roll in. When it doesn’t, they get frustrated and claim that affiliate offers don’t work for them. Here’s the problem: Adding affiliate banners to your sidebar is NOT an effective way to to use affiliate offers. Why not? Because they look like ads and there is no real reason to click on them. By using this banner strategy, you might earn a little money and if you ever get huge amounts of traffic, they will convert, but compared to the strategy I’m going to tell you next, the earnings will be chump change. The way to effectively use affiliate offers is to use text links embedded in your articles. Yes, that’s the big trick – simple, but highly effective. There are a number of ways to use text affiliate links, and if you were paying attention, you’ll note that I used this method in the section just before this one. Using text links in review articles is even more effective. I’ll go into a little detail in the next section. Here is the next big tip – If you want your readers and visitors to click on your affiliate links, those readers and visitors have to trust you. The more trust they have with you, the more likely they’ll click on your offer. I have a personal policy that I put in place in 2007, when I first started using affiliate offers on my blogs – I will never put an affiliate link on my site for a product or service that I haven’t personally used. Any affiliate link you see on Side Income Blogging is to a product or service I like and either use or have used. I put this policy in place because I saw so many bloggers recommending junk to their readers just to earn a quick buck. I refuse to do that. I also refuse to write up a “good” review just because one of the product or service companies gave me the product or service for free. When you read a review here on Side Income Blogging, it will be straight up and honest, don’t ever doubt that. As my kids say, “that’s just how I roll“. Oh sure, if I did just recommend anything that earned me a buck, in the short term I could make lots of money. But, in the long term, my readers would slowly lose trust in me. When that happens, they stop clicking on my affiliate links, even when they were for legit and good products. Even worse, they stop reading my site. Treat your blog and your readers the same way. Do so, and you will be successful. Nobody ever wins in the long term by cheating and deceiving people. Find a product that you either currently use, think you might like, or think your readers might like. Write up a comprehensive review article on the product. Try to include screen shots. Screen shots not only help the reader see the product, but it confirms for them that you have used it. Publish the review article. That in and of itself will be successful. To really turn up the conversations though, reference your review article from other articles. As I said earlier, the key product for me right now is the Thesis WordPress theme (see how I seamlessly inserted that link). I use it on all of my blogs and frankly love it. I wrote up a comprehensive review article and published it. The review article contained affiliate links spread throughout. Then, whenever I wrote an article and referenced Thesis, which I do often, I link to that review article. Visitors often click the link, read the article and end up purchasing the Thesis theme. They get an awesome theme, that I use on all of my sites everyday, and I get paid $50 – $100 commission. This is a wonderful win/win scenario for us both. Of course reviews are just one option. Just in article linking to affilate offers can be very effective. You can also place affiliate banners in articles. While not as effective as text linking, in article banners are far more effective than sidebar banners. As I eluded to earlier, unfortunately a number of websites and bloggers were promoting any affiliate offer that paid a good commission, and many of these products were not good products or just plain scams. As a result, the US federal government, and specifically the FTC implemented guidelines on affiliate links that require website owners and bloggers to disclose affiliate links. Now, the exact best way to do this is a little gray. Some say just having the disclosure in your disclosures page of your site is good enough, while others say you have to tell your readers next to the affiliate link. Who’s right? I honestly don’t know, but it’s just not worth it for me to jeopardize my online business based on some gray areas – So I do both. I disclose my affiliate linking on my disclosure page (feel free to copy it) AND I’ve started disclosing affiliate links directly in my articles as well. I am most certainly not a lawyer nor an expert on these guidelines – So please make sure you read them yourself, understand them and implement what you feel is required on your site. I would encourage you to spend sometime today registering for the various affiliate networks I listed above. Then spend some time finding one or two products that you think your audience would be interested in. Perhaps they are products you currently use. If not, obtain the product, spend some time learning about it and write up a review and include your affiliate link. Keep an eye on it over the next few weeks, link to the review article and see how it does. Come back here and report how things worked for you. As always, if you have questions, just drop me a line. For those of you experienced with affiliate marketing, did I miss any key tips? How do you guys feel about affiliate marketing in general? I know it’s a pretty hot topic for some. Alright, let us say you have enough traffic and an established base of customers, how do you get your earning to the bank, is there another system used and what are those systems called. Please ,can you enlighten me! Kafka – with the affiliate networks, you specify the way they will send your money. I typically use Paypal, but many will do a direct bank transfer or send you a physical check as well. I keep a close eye on my comments. Responding to my readers is a high priority for me Kafka, and you’re most welcome. When you say feel free to copy the disclosure, does it mean that I have permission to use it on my site? Thanks for the response. I also emailed you regarding a question that I have about blogging. Hope to hear from you soon! Great article! I’ve been thinking about affiliation programs for awhile and really excited to have a go or at least start thinking about it. Thanks! Hey Christine, you’re most welcome! Fantastic article!! Larry, actually I have a free blog site and want to start affiliate program on it, so can I? I got infos regarding what and how affiliate do but I want to know for free blog site. Thanks in advance. Harry, I don’t think there are any limitations with blogger, but be sure to read over their terms of service. Thanks for an interesting article! I found this great site, http://apprl.com/publisher/, for making money on my fashion blog and it really works. You can tag your photos with products (which I mostly use), pick up text links and create your own shop. It took a while for my readers to catch on but once I informed them that they can buy the products I’m wearing by just clicking the picture things started to happen. I have about 25 000 weekly readers and I earn about $800 a month.